Institute for the Scientific Study of Consciousness - Goals and Projects "This is the spiritual reality. We are here to learn lessons of love"
"This is the spiritual reality. We are here to learn lessons of love"
1. To continue to write and publish articles for the mainstream medical and scientific literature, to contribute towards a body of research. A. Morse ML, Williams-Beem L: The Benefits of Reiki Therapy on a Severely Neutropenic Patient with Associated Changes in a True Random Number Generator. J of Alternative and Complementary Med December 2011. 2. To continue to write and publish for the popular press to educate the general public as to the spiritual significance of Spiritual Neuroscience. B. Morse ML: Chapter on The God Spot, in Varga J: Heaven is Here ARE Press 2011. 3. To show how near death experiences contribute to the Art of Dying. Spiritual Experiences can plant the seeds of healing for grief. Click here for example of how non-local perceptions can help heal grief. A. 2010: Lectured on the Art of Dying to Delaware Hospice and Beebe School of Nursing. B. 2011: Lectured at Delaware Hospice Care in Delaware. 3. To help people understand the New Mind Technologies inspired by the Near Death Experience. These New Mind Technologies can enhance our ordinary lives, increase our intuition, and provide richer meaning to life. A. We have now taught over 20 people the SRI Controlled Remote Viewing Protocol. Please note, we do NOT teach controlled remote viewing. After learning the protocol, the great majority of our students have had profound transformations in their lives. This includes physicians who then also became energy healers and psychics who had significant increases in their abilities. Debra Katz, of our sister organization, has gone on to have an episode in Randall Sullivan's The Miracle Detective on the Oprah Network. B. We are lecturing and having media appearances in which we discuss controlled remote viewing in the greater context of non-local perceptions. C. Our sister organization Keri Beem Research Foundation has two speakers at the upcoming IRVA.org organization meeting in July 2011. 4. To development new treatment strategies for PTSD and autism based on the New Mind Technologies. 5.. To continue to research and understand the mind's ability to alter the data stream of a true random number generator during non-local consciousness. B. 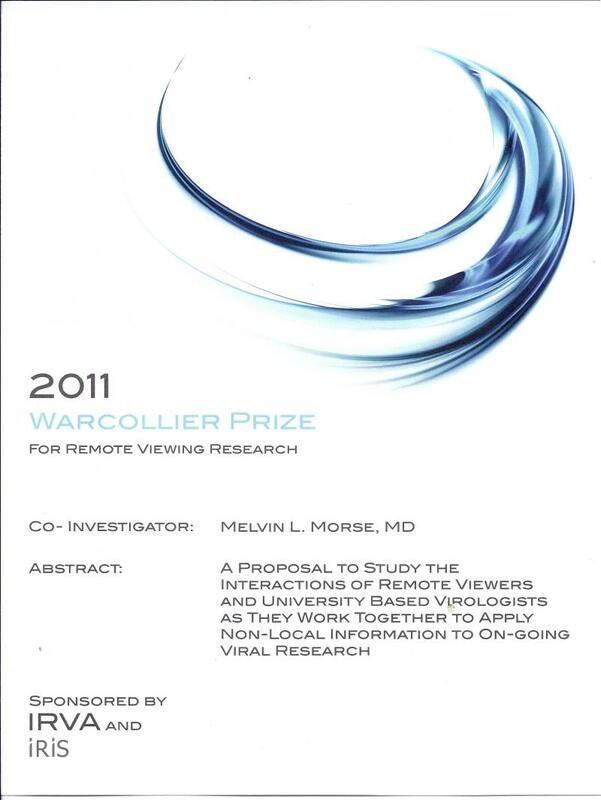 In 2010 we completed a study of remote viewing viruses in plants. We were able to increase the success rate by combining remote viewing with a true random number generator. This was presented at the 2011 University of Arizona's Science of Consciousness Conference in Sweden. C. In 2009-11 we have been honored by the World Health Organization NGO on Science and Spirituality (www.iiihs.org) for our research on energy healing and the random number generator. D. Our article on the random number generator and Reiki was published by J of Alt and Comp Medicine in December 2011. 6. To continue to apply the New Mind Technologies to the development of intuition, especially for law enforcement, military personnel and the Corporate world. We want to teach the civilian world how to use the military developed remote viewing techniques to improve their ordinary lives, enhance energy healing, understand medium-ship among other goals. A. A 20 year study of out-of-body experiences in law enforcement personnel and how they have used them to save their own lives. B. Dr. Morse and his Applied Remote Viewing Team are one of a handful of civilian remote viewing teams in the nation. We were trained by the elite of remote viewing including Paul H Smith, Lyn Buchanan, and Stephan Schwartz. Few remote viewers have received training from all three men. 7. To continue to network with other research scientists and neuroscientists to develop Spiritual Neuroscience as a medical and scientific discipline. A. We currently actively work with scientists at 6 major Universities in South America, Europe, England and throughout North America. Institutions include the University of Washington, the University of Arizona, Yale, Wayne State, University of Montreal among many others. We exchange information with other cutting edge researchers such as Pim van Lommel, Mario Beauregard, Peter Fenwick, Amit Goswami, Stephan Schwartz among others on a regular basis. 8. To continue to work with students who want assistance in their own reports, projects, or research proposals. This includes everyone from high school students to Medical Residents and graduate students. 2. Studying energy healers, specifically REIKI healers. We currently need $2000 to study Distance Reiki's effect on stroke patients. 3. We are in the middle of a two year project interviewing law enforcement, prison guards and military personnel about their intuition and out of body experiences. Please contact us if you have such an experience to share. 4. Understanding how the right side of the brain can access non-local consciousness. 5. Learning how we can best incorporate the lessons of the near death experience into our daily lives. 6. Ultimately, we believe that understand the neurobiology of the near death experience will lead to new therapies for autism, post traumatic stress syndrome, and treatments for the human spirit. TO SUPPORT OUR PROJECTS PLEASE PURCHASE OUR BOOKS THROUGH THIS WEBSITE. 100% OF SALES GOES TO OUR PROJECTS.